Stocker Gold - Hudson Livestock Supplements Inc.Hudson Livestock Supplements Inc. 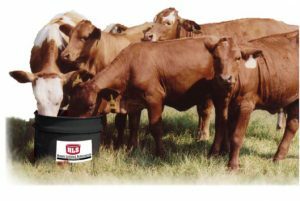 The Stocker Gold Tub is designed for calves and yearling's going on to pasture. Stocker Gold has been formulated for young growing animals, to promote digestion and intake, and to support a healthy immune system. Stocker gold stimulates intake with the use of high sugar molasses and salt, animals start on Stocker Gold quickly. Fortified with COMAX a natural feed additive and Yucca Schidigera, to promote bacterial growth and increased rumen function. Provides all the necessary minerals, vitamins and trace minerals required for young growing animals.